The Microsoft Surface has been ranked the highest in overall consumer satisfaction, and six points above Apple's iPad in second place, according to J.D. 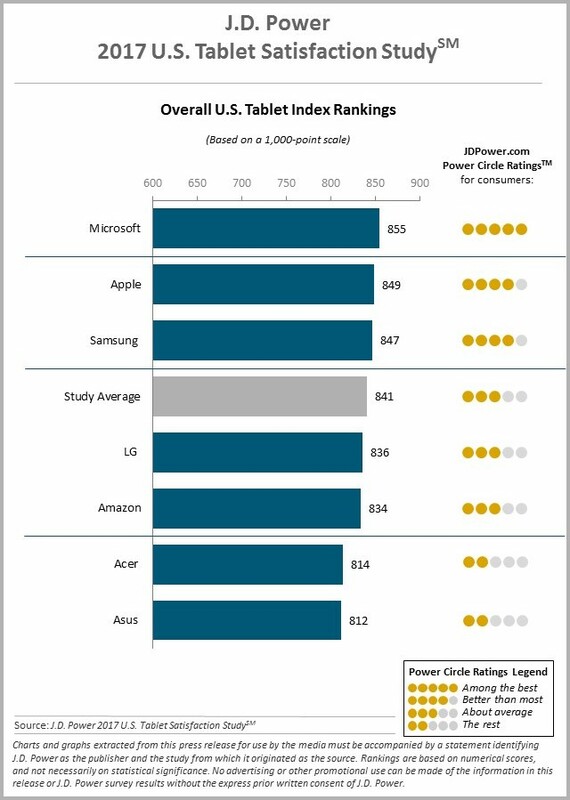 Power's 2017 U.S. Tablet Satisfaction Study. This marks the first top spot win for Microsoft in all six years that J.D. Power has published the Tablet Satisfaction Study, with the company earning a total 855 satisfaction score out of a potential 1,000 points. The J.D. Power U.S. Tablet Satisfaction Study measures customer satisfaction in the tablet market by looking at five areas: performance (28 percent); ease of operation (22 percent); features (22 percent); styling and design (17 percent); and cost (11 percent). The study accounts for 2,238 tablet owners who have owned their current device for less than one year, with participants being questioned between October and December 2016. With these rankings, Microsoft has received the designation as "among the best" on the market, while Apple at 849 points is "better than most." According to J.D. Power, Microsoft's win this year "is largely due to its top rankings in the features and styling & design factors." The company earned top marks in categories related to the variety of pre-loaded applications, internet connectivity, and availability of manufacturer-supported accessories. This last category highlights the Surface's versatility, according to consumers, who reportedly "have the highest incidences of accessory use" with Microsoft Surface when compared to competitors. Specifically, the Microsoft Surface's stylus saw a 48 percent usage rate in comparison to 27 percent of the industry average, while the tablet's add-on keyboard had a 51 percent usage rate in comparison to just a 14 percent industry average. Rounding out the Surface's pros were its variety of input/output ports (like a microSD card slot, USB 3.0, and 3.5mm headphone jack) and amount of internal storage available. Microsoft also beat Apple in areas like the size of the tablet, quality of materials used, and attractiveness of tablet design. Microsoft's customers who are using the Surface Pro line of tablets are said to largely be early adopters (51 percent), younger than the customers of its competitors, and "more likely to consider productivity features as important." Microsoft customers tend to list productivity-related tasks as "very important" in comparison to industry average, like emailing, word processing, and banking. Overall, J.D. Power found that customer satisfaction with their tablets is rising, with the study average sitting at 841 and increasing 21 index points from the six-months-ago iteration of the study. Customers are also tending to choose large screens, with satisfaction at 869 points for customers with screens measuring 10 inches or more, 850 points for screens 8-10 inches or more, and 824 for screens less than 8 inches. Driving the selection process: Lower price and past experience are the most commonly cited reasons for tablet selection among customers (22% each). Reputation is next at 19%. Data plans increase satisfaction: Nearly one-third (32%) of customers have a data plan with their tablet. Overall satisfaction among customers with a data plan is 863 vs. 834 among those without such a plan. Apple has moved up and down J.D. Power's Tablet Satisfaction Study throughout the years, earning the top spot on some iterations of the study, while falling back down a few months later in others. Previous first place holders include Amazon and its Fire Tablets, as well as Samsung. When it's on top, Apple has used J.D. Power's ratings in numerous web campaigns in the past. Hows that iPad "Pro" Tim? Maybe one more stupid commercial? Not surprising. ....it runs a full desktop OS. This strong competition from Microsoft is great. It should inspire Apple to improve their products. They have had little motivation for too long. The iPad after many years is still just a big iPhone! Innovate the iOS then you'll have my $ Apple. As someone who just switched to iPad Pro 12.9 from Windows 10 tablet I would have to say, nope, not so in my opinion. It is nice to run a full desktop but it doesn't work right switching between desktop and tablet modes. Also it slows down horribly over time as Windows tends to do as it gets more and more bloated. Some models have really noisy fans that turn on. The iPad pro does not have a fan. I was in a meeting with someone who was using one and the fan turned on. It was difficult to hear in the meeting from time to time because of the fan. It was a serious distraction. Yes, having a desktop and tablet combined is nice, however the drawbacks is Windows 10. It's a hot mess. I love my iPad (browse the web, Netflix, etc...) but anything outside of that, I go to my Mac. The iPad is gimped by iOS. I know Apple's mentality is to make iOS simple but as years go on, there will be more tech-savvy people; the old generation who never used computers will be going away. Prime example of gimping: viewing files. I don't want Finder on my iPad but I hate how files live in apps in iOS. For example, I have documents created in Pages and in Word. Why can't I just see all my documents in one view? Or if I delete Pages, I will lose all my Pages' documents (unless I move them one by one). Are you still stuck in 1990? Not surprising. My wife currently uses an iPad as her main device, but constantly has to switch back to the mac to do bigger word processing, etc. She really wants one device to rule it all. We are looking at a Surface for her next machine. The way it seamlessly blends both multi-touch and pointer-based UI is really appealing to her - and me tbh. I wish Apple would get off its high horse and recognize that maybe in Apple's purist sense they don't like mixing a touch OS with a pointer OS, but users want that. Enough with the Henry Ford analogies... these products have been on the market for a long time, so in this case, the customers DO know what they want. They are choosing what Microsoft is giving them rather than what Apple isn't.